Naperville Mayor-emeritus A. George Pradel. Naperville has lost its best friend and biggest booster. Mayor-emeritus A. George Pradel died Sept. 4 at Edward Hospital — the day before his 81st birthday — surrounded by his children George, Carol and Gary. Visitation is set for 10 a.m.-6 p.m. Saturday and Sunday at Naperville City Hall, 400 S. Eagle St. A private funeral service and internment will follow. Pradel was admitted to Edward Hospital several weeks ago suffering from severe pain in his back and neck. Doctors found a cancerous tumor and the cancer quickly spread through the rest of his body. He was in hospice care at the time of his death. Pradel served as mayor for a record-setting five terms from 1995-2005. Prior to becoming mayor he spent 29 years with the Naperville Police Department, retiring as Lieutenant of Police. Tributes quickly flowed in from top officials to ordinary citizens. Born in Chicago’s Hyde Park neighborhood in 1937, Pradel and his family moved to Naperville two years later. Pradel served as a U.S. Marine from 1956-59 and then earned an associate degree in Police Science from the College of DuPage. He served in the Naperville Police Department for over 29 years before retiring in 1995 to become Mayor. Known as ‘Officer Friendly’ to generations of Naperville residents, he was best known for his countless public appearances and robust enthusiasm for the city. He continued to be Naperville’s leading cheerleader after being named the first Mayor Emeritus following the end of his tenure as mayor in 2015. “George Pradel was the kind of community-focused individual that blesses a town once in a lifetime,” Naperville mayor Steve Chirico said in a statement. “His name will forever be remembered in our city, and when people think of him, they will remember an individual who quietly and humbly gave of himself through his 29 years as a police officer and then for two decades as our longest-serving Mayor. 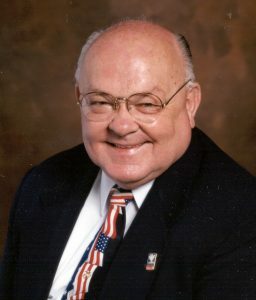 A member of the Rotary Club International, Illinois Police Association and Chamber of Commerce, Pradel was the recipient of numerous awards, including from the Rotary Club, Boys Scouts of America, the Lifetime Achievement Award from the Chamber of Commerce and an Honorary Doctorate from North Central College. Pradel was perhaps best known for bringing the national Safety Town program to the Naperville community in the 1970s. Now serving over 1,700 students in its summer program each year, generations of Naperville children have learned about pedestrian, bike, fire, water, railroad, bus, animal and personal safety thanks to Pradel’s efforts. The facility was renamed the A. George and Patricia Pradel Safety Town of Naperville in 2015. Pradel and his wife, Patricia “Pat” Pradel, were married for 55 years before her death in August 2015.